The Life of Raymond L. Perkins, Jr.
Raymond L. Perkins, Jr. was born on May 29, 1921, the son of Raymond, Sr. and Gladys Hillier Perkins of Orrington. 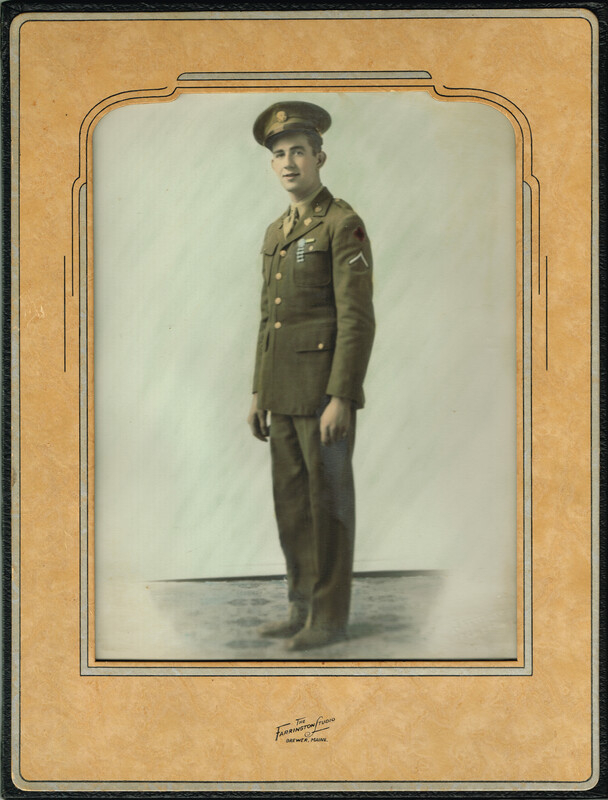 He enlisted in the National Guard on 03/12/40, serving with the 152nd Field Artillery, Battery E as a truck driver and machine gunner in the Pacific Theater. He was in combat for 2 months and contracted malaria – losing 40 pounds in 2 months. Ray was medically discharged on 11/02/43 and was honored with the Asiatic-Pacific Campaign Ribbon with 2 Battle Stars. Raymond settled in Orrington where he returned to the family farm. He worked for the sheriff’s department for 12 years and was employed as an R.F.D. carrier for 24 years. Louise Smith became his wife on December 12, 1943, and they raised three children – Gerald of Orrington, Peter of FL and Diane Mallory of NH. *Raymond Perkins passed away in 2011. An album of photos relating to the Perkins family can be found on our Facebook page.